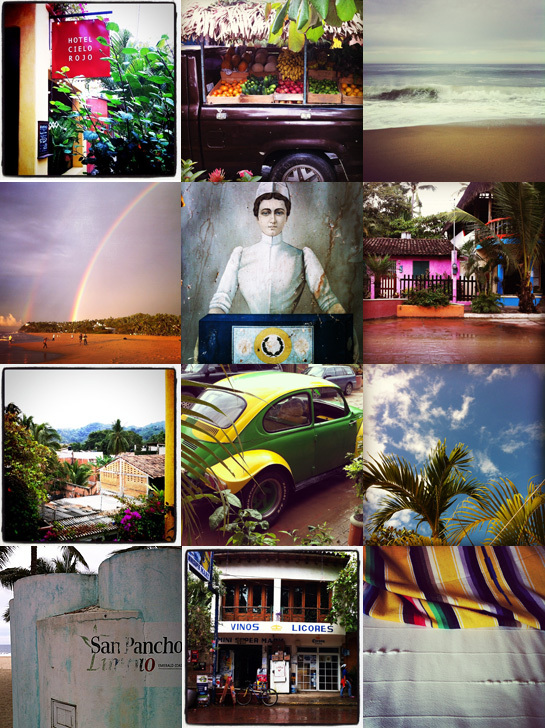 We’re back from San Pancho and, uh, I might be on about color for awhile. I think this was my fourth trip to Mexico, but it was the first time I really felt like I was in Mexico. And it was certainly the first time I was affected by the famous color. It was uncharacteristically rainy while we there, so it was a slightly atypical experience — soft grey light; wet sand, wood and terra cotta; tons of the weathered, moody blue-greens I love so much. It’s a lush green jungle in that part of the country (unlike arid southern Baja), with bougainvillea everywhere. Then of course all that hot pink, yellow, red, green and blue paint on every surface, dappled with rain. I’m telling you, I close my eyes at night and my head is swimming in it. Winter rains and cooler temps have returned to our home turf, so I’m sure I’ll be back to my grey and navy ways in no time, but I’m hoping this influence lasts a bit. This entry was posted in Thoughts and tagged color. Bookmark the permalink.